President Donald Trump’s new national security adviser chaired a nonprofit that has promoted misleading and false anti-Muslim news, an NBC News review found. 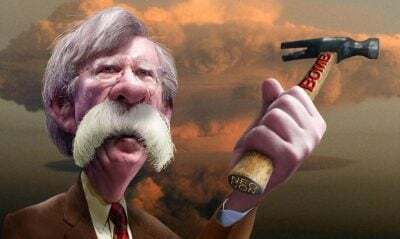 From 2013 until last month, John Bolton was the chairman of the Gatestone Institute, a New York-based advocacy group that warns of a looming “jihadist takeover” of Europe leading to a “Great White Death.” The group’s authors have also appeared on Russian media, including Sputnik and RT News, criticizing mainstream European leaders like French President Emmanuel Macron. Alina Polyakova, a Brookings Institution fellow who studies far-right populism and disinformation campaigns in the European Union, said Gatestone is “putting out content that was clearly anti-immigrant, anti-Muslim and was echoing some of the Russian disinformation propaganda” being spread by internet trolls and on social media. Gatestone has been a significant promoter of the disputed notion that “no-go zones” exist in the heart of major cities where Muslims rule by Shariah law. In January 2015, then-Gov. Bobby Jindal of Louisiana, a Republican, cited Gatestone’s research in a speech in London. In September 2015, Fox News contributor Steve Emerson, who’s also written for Gatestone, said in an appearance on the network that the British city of Birmingham is a “no-go zone” for non-Muslims. The claim prompted the British broadcasting regulator Ofcom to find the network in breach of its broadcasting code. Emerson later apologized. One of the retweeted stories that Gatestone instigated claimed that 500 churches in London have closed while 423 new mosques have opened, which went viral and was picked up by numerous websites including Breitbart News. The fact-checking website Snopes.com said Gatestone used “shoddy research and cherry-picked data” for the story, which was clearly not true. Gatestone is in part funded by the William Rosenwald Family Fund, which funds a host of pro-Israel groups including the Middle East Forum. Gatestone has also received financial backing from Robert and Rebekah Mercer, the billionaire father-daughter team who have supported conservative candidates in the U.S. including Cruz and Trump. The Mercers also co-founded Cambridge Analytica, the data company being scrutinized for its activities that have allegedly influenced the Brexit EU referendum. The British High Court granted the Information Commissioner’s Office a warrant to search Cambridge Analytica’s London offices in March. There are now a number of court action and libel cases currently in play. In an archived 2017 web page, Rebekah Mercer was listed as a member of the Gatestone Board of Governors.